Well this particular review has been more than overdue, credits to my mommy brain dabbling into multiple things!! 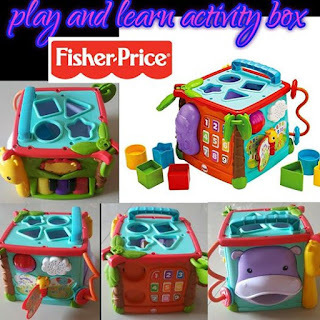 Here i am going to review one of our first and favourite toys, Activity box by Fisher Price. This activity box/cube was gifted to A by one of my very good friends from school. It was introduced to A when he was 6 months old. Initially it didn't interest him much. Just the lights and sound, what more can we expect from a 6mo. I used to put the cube infront of him and let him explore it. By the time he was 8 months old he knew everything that he could do with it, that was quite a lot, given the no. of activities. The shape sorting needs finer skills, so he couldn't do that, but he knew if if something was put from top it would come out from the hippos mouth. I keep rotating the toys, but this is one toy that has constantly been on our shelf since the time we received it. The box has 5 sides and multiple activities to engage your little one. 8 shapes that can be sorted from the top, these shapes spill out as the baby lifts the hippo's mouth on one ofvthe sides. One side has a dummy phone and a colorful keypad to teach numbers and colors. On another side there is this cute butterfly book that plays "abcd " and a number song when one flips the page. One of the sides has a peekaboo lion. The interactive lion blurts out different things each time it is pushed down. Below the peekaboo lion is a piano playing different notes and blinking lights. There is also an attached spiral bead bar, rolling ball and leaf shaped clankers. The Fisher price activity cube is good to enhance the fine motor skills, hand and eye coordination, sensory and linguistic skills. The toy can be introduced at 6 months and will be useful upto 3 years with the assorted activities it offers. What I love the most about it is it's variety, it can be a great toy even without having the batteries on. It is easy to carry and quite sturdy. Too much variety in one box can be distracting for the child. Expensive- the activity cube is priced at 2700 Rs. You may get it a little cheaper during online sale, the lowest price that I saw online was 2100. All in all a great toy! I just loving this colourful and attractive toy. Its looks like a complete set of many different toys. It's easy to carry even. It include so many great and fabulous features and with many activities. Best for gifting also. Overall I liked this toy. Will try to get this one for my two yrs son. The post shows such a cute toys. Loved it Fisher Price is an amazing brand. I love all toys from them thanks for sharing this post. They are such cute and lovely baby toys. I remember my childhood days seeing them. Looks amazing btw I have used lots of toys from this brand and I love fisher-price products.